Preparations for the festive season are well underway. From markets and merriment to trails and traditions, there’s something for everyone this Nottingham Christmas. 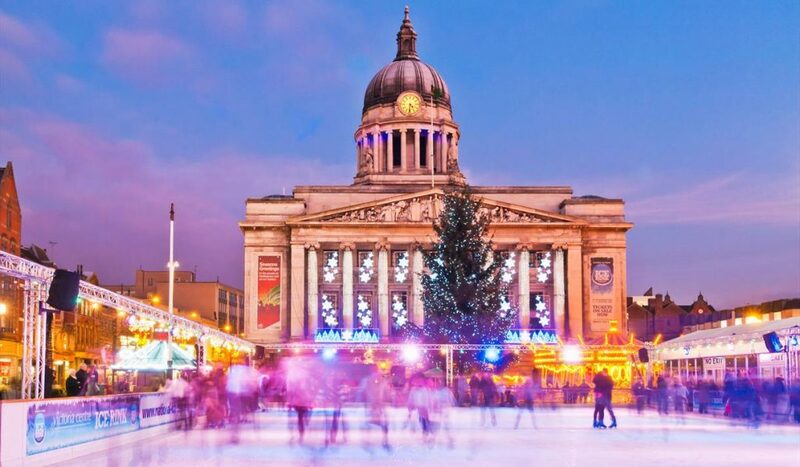 From 15 November until 31 December, Old Market Square will once again transform into Nottingham’s very own Winter Wonderland. While away the hours browsing over 70 traditional, Bavarian-style stalls, searching for the perfect gift among handmade jewellery, woolly winter wear and wooden crafts as well as sampling the delicious homemade and artisan cheeses, chutneys and chocolates on offer. Kids can enjoy the traditional rides and helter-skelter, and the whole family can show off their skating skills on the real, 750m² ice rink. After all that, chill out with a drink (or two) in some pretty cool surroundings—the UK’s biggest mobile ice bar. 2018 also sees the return of last year’s hugely successful ski lodge-style bar, Sur La Piste, which will see live entertainment and some exciting new additions this year. Tickets for the ice bar and skating are now available via www.whatsonnottingham.com and www.nottinghamwinterwonderland.co.uk. Just outside the city, head to A Storybook Christmas at Newstead Abbey (every weekend in December) for an enchanting fairy-tale experience. Lord Byron’s ancestral home will be transformed by Christmas trees, floral displays, fairy-tale decorations, lights and Christmas music. Take a festive tour of the House or enjoy a wintry trail around the Gardens. Afterwards, meet real fairy-tale characters and browse the craft stalls in the Cloisters—all topped off with a Christmas afternoon tea in the Victorian kitchen (available to book through www.whatsonnottingham.com soon). There’s a whole host of festive events at Wollaton Hall and Deer Park this Christmas, including Steampunkalia at Nottingham Industrial Museum (8–9 December) and the Santa Paws event (15–16 December) – four-legged friends welcome! Christmas in the Courtyard (15–16 December) will feature Christmas readings, carols, a brass band, festive food and Christmas games and activities for all the family, and don’t miss Stories with Santa or the Family Christmas Tour (every weekend in December). And, finally, don’t forget your tree! Each weekend from 24 November until 16 December, Woodthorpe Park Plant Shop will turn into a beautiful Christmas market brimming with all things magical and festive. Pick your own fresh Christmas tree – whether a classic Nordmann or, new for 2018, a Fraser fir – while enjoying roasted chestnuts, gifts and local crafts, amazing food, live music, wreath-making and much more.